The HPI Trophy range of off-road racers has been updated with the latest in 2.4GHz radio technology, waterproof servos and a waterproof receiver & battery compartment! That's right: one of our most popular nitro kits ever now has been upgraded to make it a performer just about anywhere! The Trophy Truggy 4.6 is the perfect way to get into nitro 1/8 truggies! A 'truggy' is part truck with its big tyres and pick-up truck style bodyshell, and it's also part buggy with the main drivetrain components, chassis and suspension being taken directly from or derived from a 1/8th scale rallycross buggy chassis. Truggies are a popular racing class around the world! This kit has got everything you need for anything you want to do. For bashing fun and big-air stunts, it has a durable aluminium chassis, braces and shock towers, and for race track performance and tuning the Trophy is equipped with the amazingly powerful Nitro Star F4.6 HPI engine, angle-pin racing tyres, oil-filled shocks, turnbuckles and plenty of tuning adjustment possibilities. In addition to being race-bred and ready for track action, the updated Trophy Truggy 4.6 looks great, too. The aerodynamic racing truck bodyshell features a brand new paint design, and the Shredder Block angle pin racing tyres are wrapped around cool black chrome Edge 7-spoke wheels. The rear wing isn't just for looks, either - it gives the Trophy loads of downforce and control in the air. To top everything off, we've updated the anodizing of the shock caps, wheel nuts and more to HPI-spec bright orange! Want to tackle that muddy bug? How about that stream crossing? A bit of rain about to fall? That's all fine for the Trophy! The Trophy Truggy 4.6 now features a cool waterproof electronics compartment for the receiver and receiver batteries and a pair of HPI SF-10W waterproof servos and finally a water-resistant air filter cover that allows you to keep running the Trophy Truggy 4.6 in truly extreme conditions! Please note: This HPI vehicle is designed to provide water protection so it can be driven in wet conditions (e.g. rain, snow, puddles). Not for submersion. Nitro engines are splash protected and require extra care when running in wet conditions. See manual for details. The awesome Nitro Star F4.6 engine from the legendary Savage 4.6 monster truck provides all the grunt needed to get the Trophy Truggy up to wild speeds - it's extra-loud, super-powerful and mightily strong, so you'll be able to rip off huge stunts like record-setting long jumps, backflips, tall jumps, even double backflips! The F4.6 engine will give you eye-opening acceleration and crazy top speeds! The engine is started by a simple pullstarter system and is protected by a unique water splash cover and 2-stage air filterfor extra protection, and the two-needle carburretor allows you to fine-tune the performance for any kind of weather or fuel. The Nitro Star F4.6 is the perfect match for the Trophy Truggy, with its subdued grey CNC-machined heatsink head, finned aluminium case, composite-body slide carburettor and full range of tuning adjustments to let you tune it for all weather and track conditions. On the inside, the F4.6 has true ABC construction, with a chrome-plated brass piston and cylinder surrounded by the lightweight aluminium case. To get you going quickly, the F4.6 uses a pullstarter system, and a large opening on the underside of the chassis allows you to utilise a starter box for even faster engine starting. If you want to upgrade to simple engine starting, just install the #87130 HPI Roto Start 2 engine starting system for push-button engine starting! The chassis of the Truggy 4.6 is made from 6061 aluminium for an excellent combination of strength and light weight. The low weight allows for faster acceleration, and the durability means you can have the confidence to pull off insane stunts and jumps! To increase the chassis stiffness, it's fitted with a metal rod brace and thick aluminium steering brace up front and a huge vertical aluminium plate brace in the back! This allows the suspension to do all the work it's designed to do for increased driving feel and control without chassis twist or bending getting in the way. 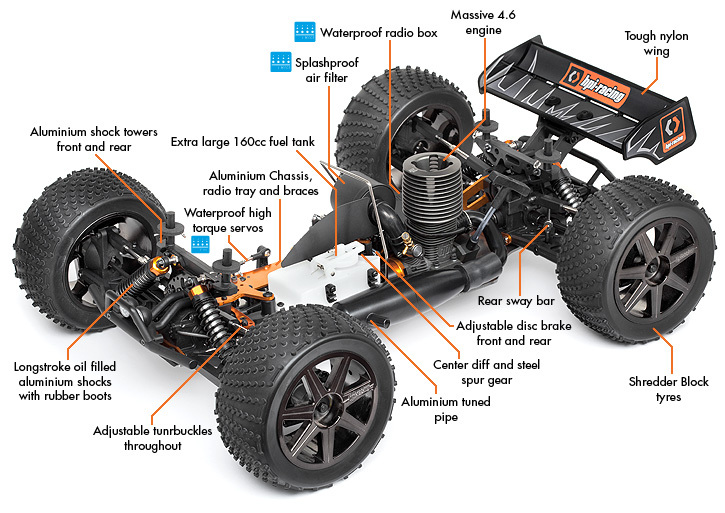 The drivetrain used in the Truggy 4.6 is a full-time four-wheel drive shaft-type drivetrain. The shaft drivetrain is the best option for a kit that's expected drive through mud, water, dirt, grass, snow or gravel! The entire drivetrain is supported by high quality ball bearings for extra efficiency, so you get the the maximum speed and acceleration possible, and the most out of every tank of fuel! A strong steel spur gear takes the power from the engine and transmits it through a central differential, which transfers power to the front and rear diffs by long central driveshafts. The front and rear bevel differentials use 4 internal gears for excellent durability over standard 2-gear diffs. The diff outdrives turn tough steel outdrives and axles, and 17mm orange anodized aluminium hex adapters spin the 7-spoke wheels, which are are wrapped with Shredder Block angle pin rubber racing tyres. To bring the Trophy to a safe and controlled stop, dual drilled steel disc brakes with fibre brake pads are used. The brake pads use material from full-size trucks, bringing the Trophy to a quick yet controllable stop. All the brake linkage is fully adjustable for extra tuning power on the track. The Trophy Truggy 4.6 is fully equipped with a real racing suspension to give you the driving feel and responsiveness of the pros! Long suspension arms at each corner are made from thick, impact-resistant plastic and webbed for extra strength. The shocks feature aluminium bodies and caps for extra durability, and are oil-filled with rubber bladders and protective boots over the thick shock shafts. For pro-level race tuning, the shocks can be moved at the top and bottom to get the perfect positioning to help you set fast laps race after race. The camber links front and rear also have extra holes to adjust roll centre and gain valuable seconds out on the track, and the camber links themselves are strong steel turnbuckles so you can easily adjust the angle of the tyres. 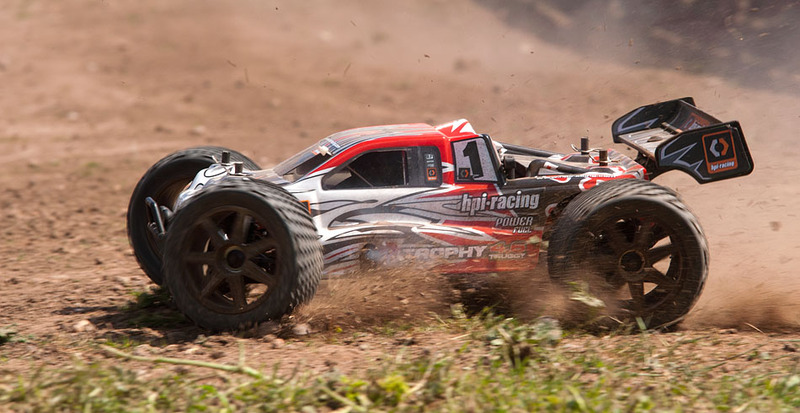 HPI makes it as easy as possible to get into RC racing action. 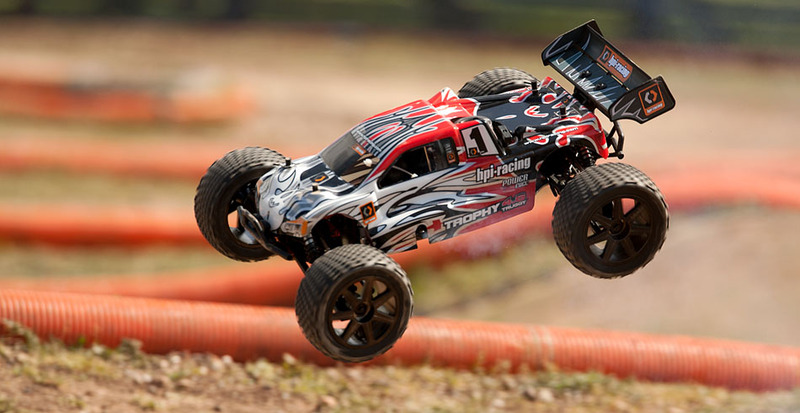 The RTR Trophy Truggy 4.6 is completely pre-built and ready to go right out of the box! Everything is assembled and tuned for you by professionals - diffs, shocks, suspension and more are perfect before you even open the package. You don't have to do a thing to get going fast! HPI Ready-To-Run vehicles bring you the same high performance and quality that you'd expect from a high end RC kit but with the added convenience of being factory pre-assembled to the highest standards - giving you a high performance RC car straight from the box! WHAT YOU NEED: Nitro Car Fuel Fuel Bottle Glow Plug Igniter #110605 HPI Nitro Starter Pack includes everything you need, just add fuel! 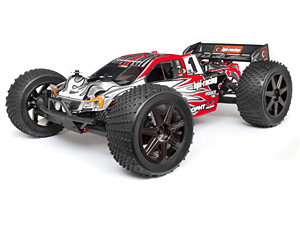 Click the button below to add the HPI Trophy 4.6 Nitro Truggy 1:8 #107014 to your wish list.